Waterside Inn is truly a beautiful restaurant. Sipping champagne on the terrace while watching ducks, swans and assorted yachts pass by on the Thames is magical. The dining room glistens with gleaming silver, sparkling crystal and starched white linens. We started the evening on the terrace with amuses — a baguette with Serrano ham topped with a dab of parsley puree, a large oval olive bread crisp and smoked salmon with crème fraiche and caviar. After a lengthy discussion with the ebullient manager, Diego Masciaga, we decided to skip the “Menu Exceptionnel” and order a la carte. We were shown to our table. The view and positioning was lovely. There is a row of 4 tops right out at the window edge, then a row of deuces positioned in the space between the 4 tops. The scene is always in view. Amuse at the table –chilled gazpacho with lobster. This was way too weak, flat and completely under seasoned. I was surprised that the bread was not served and that you were instructed to use your hands to take what you want. Me -Crisp battered snails with fine cut vegetables and watercress mayonnaise. The snails were excellent and reminded me of fried clams. The vegetables were shredded and had the appearance of coleslaw, but with no taste. The watercress mayonnaise was presented in a waffle potato cup –a nice touch. Except for the shredded vegetables, an excellent, well-executed dish. Unfortunately the next course came within a few minutes of the previous course. We felt rushed and asked them to slow it down. We both had the Pan fried lobster medallions with a white port sauce and ginger flavored vegetable julienne. This was an absolutely “signature” dish. It deserves the raves. The lobster was sensational. You are immediately aware of how fresh it is. It was just removed from Waterside’s own lobster tank. 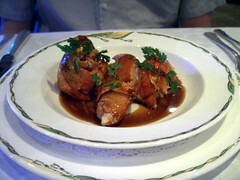 The texture of the lobster was tender with that “sweet” lobster taste. The port sauce was rich, but not cloying with a bit of heat from the ginger. John, is not a lobster lover, but he actually ate every bite and gave it the thumbs up. Grilled and roasted Challandais duck with sides of carrot puree, lemon confit in puff pastry and peas. This was a very disappointing dish. The duck is brought to the table whole to be carved. Our server turned the duck upside down to let the juices run and a few drops emerged. This was a surprise given the luscious duck juices from Boyer’s duck. The duck meat was rare, but it had none of the flavor of the wild duck at Boyer or Troisgros’ wonderful signature duck that we remembered from ’03. The saucing was a natural jus and it did say as much on the menu. But I did expect a 3 star restaurant to at least strain the jus, reduce it or do more than just serve it as pan juices. The rest of the dish certainly did not qualify for the status of 3 Star as the peas were over the hill, the puff pastry soggy and the lemon confit added nothing. We decided to skip the cheese and dessert to have coffee and mignardises in the lounge. 1994 Reisling “Kappelweg” Rolly Gassman–perfect with the early dishes…clean, fresh and yet aged to a mellowness seldom found in Reislings. 1999 Cornas, Noel Verset, this is an example of trying not to break the bank. All wines are very expensive. This is a small type of wine, big flavor when it is very good and this was very nice, but 59 pounds =$ 108.00– a lot of money for this wine. I think our impressions of Waterside Inn were colored by our fantastic experience at the Fat Duck. This is Classical French food done, for the most part, very well. But there is not the minute attention to detail, the preciseness of a true 3 Star Restaurant. It lacks the intense care given to every aspect of the food as at L’Ambrosie or Pierre Gagnaire.